The primary trinity of days in the Christian religion is the Easter Triduum: Holy Thursday evening, centered on the Mass of the Lord's Supper, through Holy Saturday evening, which centers on the Easter Vigil. That's three days in kairos time; it's really two-and-a-half days in chronos time. I now ponder another trinity of days that is of interest for American Catholics. Though it is is only two days in chronos time, it is a coincidental three days in kairos time. In the Roman-Catholic calendar, yesterday was Trinity Sunday and today is the Feast of the Visitation. In the American civil calendar, today is Memorial Day. As soon as I realized that, the thought occurred to me that all the themes can be connected with one another. As always, we must start with God even as we will end with God. 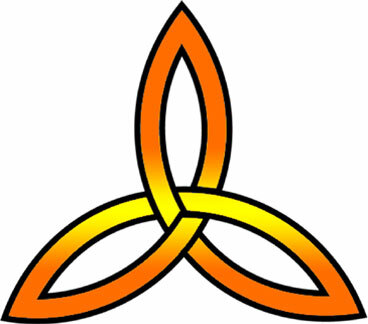 The Divine trinity of persons, which is God, is a infinite community of love. That is why the Apostle John says "God is love," and that is why the life of God, which it is our destiny to share, is inexhaustible. What the Latin scholastics called "the Beatific Vision" will not be a Big Long Stare at an Undifferentiated One, but a participation in the life of a community whose members "indwell" one another in a dynamic, mutual self-giving. Thus do they enact by choice the unity they enjoy by nature; in fact, and ultimately, the enacting and the nature are the same. By analogy, the community of saints will do the same among themselves in the world to come, and do so in part even now in the Church Militant. Imagine being called to do that forever without having to worry about bills! But in this vale of tears, such love starts small. In the run-up to the Cross, its primary expression, it buds with babies. The Feast of the Visitation (why can't they just call it 'The Visit'? I hate words only used in churchy contexts...) has a young woman miraculously pregnant with the Messiah making a trip through rough country to visit her cousin, an old woman miraculously pregnant with his herald. The fulfillment of a family duty becomes an important episode in salvation history: the Old and the New covenants join in the Spirit as they meet in the flesh for the first time. Mary's Magnificat, uttered on just this occasion, celebrates the magnificent love with which God makes use of the humble, and thus enters the world as a baby, in order to fulfill his promises to Israel. Thus began the decisive self-emptying of God for our salvation, whose eternal model is the inner life of the Trinity itself. Those whom we commemorate today, Memorial Day, made the ultimate sacrifice for their country. Perhaps not all did so willingly or well, but that is no matter; even the best of us, the saints, are saved by grace alone. And grace is not some sort of spiritual fuel for which we pull up, pay up, and tank up before we pull out of the filling stations known as churches. Grace, in the primary sense of the term, is the life of God himself lived within us, transforming us to become partakers of his nature, which is self-emptying love. To live and die by grace is to attain glory, and the only glory worth acquiring is that of self-emptying love. Many women show that in bearing and raising their children. The Americans, mostly men, whom we commemorate today poured themselves out by dying in their country's wars. In so doing, most showed the sort of love to which we are all called, even when the policies of the men who sent them to their deaths were not wise, and even though their motives were never pure. Courage and love are closely related. Mary showed courage by saying 'yes' to the conception of her Son by the Spirit, knowing what could befall her if she turned up pregnant from a source not her husband. She showed courage as a pregnant teenager doing her duty by making a trip over territory haunted by brigands. Any woman who gives birth willingly shows courage. Soldiers in combat show courage. And courage, for the most part, is an manifestation of love: the greater the courage, the greater the love. And "greater love has no man than this: to lay down his life for his friends..."
Then there are the people who don't get to love in the ways that mothers and soldiers do. I don't. I will never be a mother and have never been a soldier; though I volunteered for Iraq in 2003, I was told what I should have known already, that I was too old and slow. And so my prayer this day is not only for those who have made the ultimate sacrifice, but for those who don't quite know how they are supposed to do the same: how they are supposed to live for Christ, which is to say die for Christ. If they are faithful, and care more about God than themselves, they will be shown.